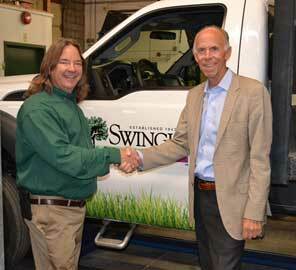 Bedford Hills, NY – October 10, 2017 – SavATree, a leading provider of quality tree, shrub and lawn care services, announced a merger with Denver-based Swingle Lawn, Tree and Landscape Care, thereby solidifying its leading position in the Colorado marketplace. This merger is the Company’s second in the Colorado market this year, and aligns with SavATree’s strategic growth plan. Earlier this year, SavATree merged with Denver-based Mountain High Tree, Lawn and Landscape. The combination of the successful Mountain High and Swingle brands, under the SavATree canopy, will provide customers and employees with greater resources and opportunities to benefit from environmentally minded services that preserve, beautify and enhance properties in the region. SavATree, the green choice for tree, shrub and lawn care, provides environmentally sensible services to residential, commercial, community and government properties in the Northeast, Mid-Atlantic, Midwest and Western regions. Property stewardship programs feature organic and hybrid plant health care, general tree care and lawn care – all highly customized to meet the needs of each landscape and its steward. Services include tree and shrub pruning, insect and disease management, deer deterrence, and lawn care, as well as tree and shrub nutrient/fertilization programs. Learn more at www.savatree.com.